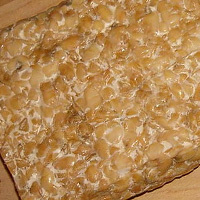 Tempeh is a fermented food traditionally eaten in parts off Indonesia. It is made from boiled soybeans that are fermented. It is said to resemble fermented whole soybeans or natto in Japan in smell. Tempeh is commonly used in vegetarian burgers serving as a meat like alternative to animal sources of protein. The calories in Tempeh per 100g(1pack) is 202 calories. Tempeh is calculated to be 202Cal per 100 grams making 80Cal equivalent to 39.6g with 15.8g of mostly protein、15.4g of carbohydrates、9g of fat in 100g while being rich in vitamins and minerals such as Molybdenum and Copper.